Facebook is another way we share God's message. You can connect with us on Facebook or check out our Facebook feed here. From "First Family Fellowships" to "just because"....we enjoy times of Fellowship with one another. It's important to be united in God's family & know one another in friendships. 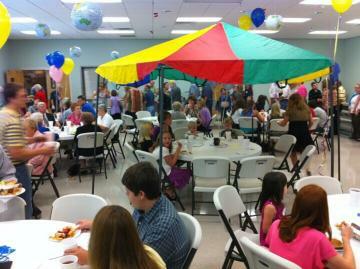 Thanks to the wonderful cooks in our church family, no one will ever leave a fellowship still hungry! No matter what age...from 0 to 110, you will enjoy the laughs, the food, the growing friendships and the blessings from being a part of church that puts God in the center & desires to have You join in! First Baptist Church....a place you want to go...a place where you can grow. Come grow with us in God's Word.